Isaiah Thomas sat out of the Celtics’ match-up with the Magic in Orlando on Wednesday night with a groin strain. The 5’9″ point guard is ninth in the NBA in scoring this year with 26 points per game, so his absence was expected to be a detriment to the C’s as they were on the road facing a team that had won four of their last five, including a victory over the Spurs in San Antonio. The Celtics didn’t just fight for a win on Wednesday, they dominated far beyond anyone’s expectations. They passed, shot, rebounded, and defended better than the Magic on their way to a beautiful 117-87 thrashing. I tweeted in the first quarter that Avery Bradley would need to have a big scoring night in the absence of Isaiah. AB responded with a game-high 23 points on 7-14 shooting, 3-5 from three. The Celtics also got a strong performance out of Jae Crowder who came away with a double-double, dropping 17 points and grabbing 10 rebounds. Al Horford continues to fill the stat sheet and show his versatility on offense and he’s surprised a lot of people lately with his shot-blocking ability. On Wednesday he had 10 points, six rebounds, eight assists, and two blocked shots. 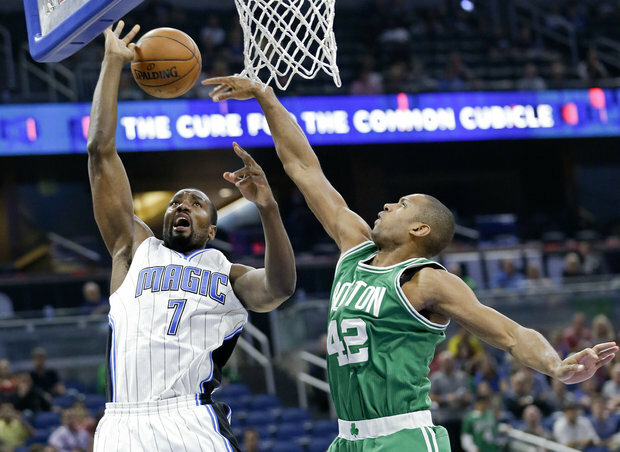 We haven’t seen a dunk like that from a Celtic since Jeff Green, who actually happens to play for the Magic now. They’re similar players from an athletic standpoint, but you can already tell that Brown has more of a killer instinct than Jeff does. Meaning when Brown reaches his mid-to-late 20’s you’ll be seeing these kinds of plays on a regular basis and not just once a month like we did with Green. Other notable performances for the Celtics included Amir Johnson with 11 points and five rebounds and Marcus Smart with 13 points and two key steals. The C’s started the season off slow due to the Horford and Crowder injuries, going 3-4 in their first seven games without those two important starters. Since then they’ve gone 10-5 and three of those five losses were to really good teams (Cavs, Spurs, Rockets). Boston’s 13-9 record is good for third in the Eastern Conference and second in the Atlantic behind the 14-7 Toronto Raptors, who visit the Celtics at the Garden on Friday. Isaiah is expected to return for that game. Tip-off is at 7:30 pm ET.